2 Timothy 2:2 The Plan of Discipleship provides practical advice on how one should disciple another and especially on how a leader of the church can implement discipleship training in the church. This is session 10/12 from the seminar Initiating Spiritual Growth in the Church. Sorry, only the handout is available. The BFF Bengali Library is now available! This cloud or Library version will includes all our India / W. Bengal / Bangladeshi resouces, including videos, audios, handouts and mp3s. Oversea pastors can check on conditions for free materials - mention India / W. Bengal / Bangladeshi Library. How does the apostle describe the discipleship situation. What is Timothy instructed to do? What was he suppose to pass on to others? We want to train those with teachable hearts. How can we better ensure that this happens? 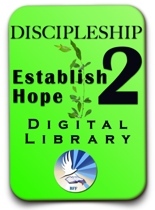 Next -> Listen to or view session #12 of the discipleship training seminar.